All Meetings of the City Council and Council Committees are open to the public. Please note that a meeting notice will be prepared for each scheduled meeting at least forty eight hours in advance listing all matters to be discussed. If there are no matters pending before the committee, a cancellation notice will be issued. All Meetings of the City Council and Committees are Open to the Public. *Latex paint is not a hazardous material but it needs to be dried out before putting it with the rubbish. Transport your materials safely: Leave materials in original containers, do not mix chemicals. Use sturdy boxes, not bags, to pack your materials. Do not smoke near the materials. Add 6 parking meters on.the Easterly side. Add 1 loading zone on the Easterly side. Make Oliver Street a one way from Elm Street heading southerly toward Main Street. Eliminate the No Parking Tow Zone and Stop sign on the Easterly side. 255-18. Police Chief Ernest Martineau, to recommend Putnam Street be converted to a one way (1) lane roadway from Main Street to Boulder Drive. 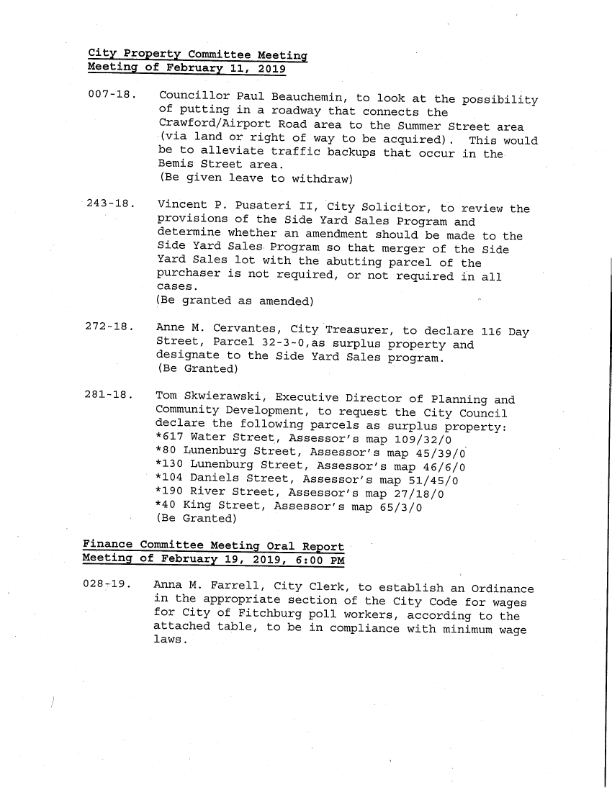 The addition of 6 metered parking spots, and one loading zone be approved. Replace with "No Parking Anytime". Remove 1 space, 1 parking meter at Elm Street and Oliver Street. Replace with "No Parking Prisoner Loading Area". Monday, January 7th, 2019 at 10AM the 2019 City Council Organizational Meeting will be held at the Fitchburg Police Department Basement Level Community Room at 20 Elm St. Drawing of names for seat assignment in the Council meeting space for the year 2019. Join us at Beemer's Pub & Grille at 310 Main St, Fitchburg for the Election Night Party! The downstairs room will be open for our private party... Results come at 8pm! Join us before and stay after. Vote for Sam Squailia for City Councilor at Large! November 7th 7am-8pm at your voting location! VOTE for Sam for your Fitchburg City Council. Thank you for your support and thank you in advance for your vote! Support SAM at the Councilor-at-Large Debate! The debate of the Fitchburg city councilor-at-large candidates starts at 6:30 p.m. Wednesday, Oct. 18, at Fitchburg State University, moderated by Fitchburg State President Richard Lapidus. The Public is invited to attend in the audience. The debate will be at the Kent Recital Hall in the Conlon Fine Arts Building, on North St. Parking is available in the lot directly across. See the map below for the location. FATV will be covering the debate live. Watch it at home live streaming at www.fatv.org and click the government stream link. Please join us for the North Central Mass Chamber of Commerce Legislative & Candidates Reception! Sponsored by Mount Wachusett Community College, this event is an opportunity to make your voice heard with our local and state legislators as well as candidates for office. Last year, 140 attendees (including 31 state and local officials) attended! as well as open bar. We have invited over 100 local, state and federal officials. We will update this list frequently. Please check our calendar at www.northcentralmass.com for the most updated confirmed attendees. How many doors will Sam have visited by Sept 7th? 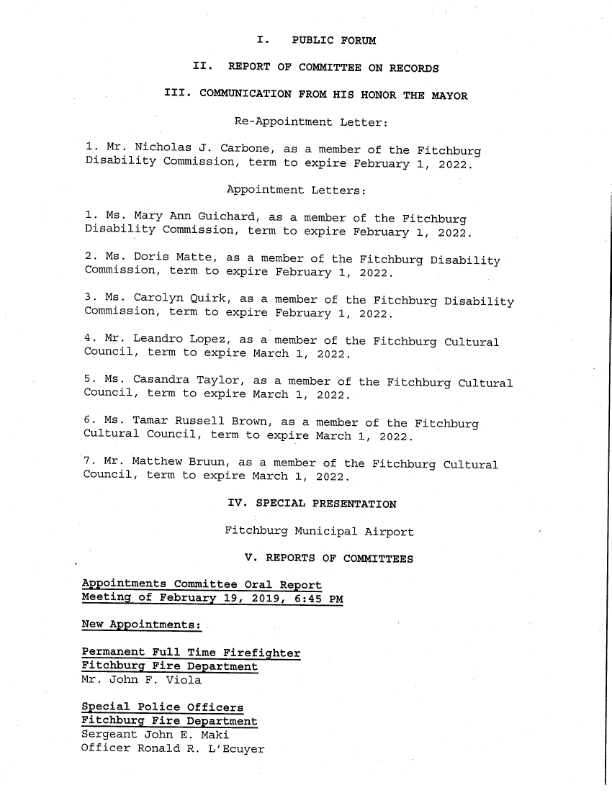 MOVING FITCHBURG FORWARD – TOGETHER! Producer & Host of Discussing Fitchburg Now! Go to elect-SAM.com and see if you can guess how many households SAM has visited citywide in Fitchburg since she announced her candidacy for City Council last May and began walking door-to-door to personally ask people for their vote. HINT: It's more than 1500 households!